As I write this, there are 44 hours left in Michael Sporn's Indiegogo campaign to raise money for his proposed animated feature on the life and work of Edgar Allan Poe. I don't want to repeat myself, but I support this project and the need for animation outside the Hollywood mainstream. If you haven't yet taken a look at the project, please do. And if you like what you see, please donate. 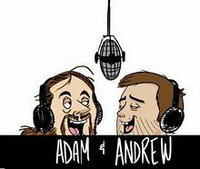 Adam Hines and Andrew Murray, two Sheridan grads who have been doing an animation-related podcast for more than a year, once again had me on as a guest. Last time, the talk was about creator rights. This time, it was more about animation schools and moving into the working world. 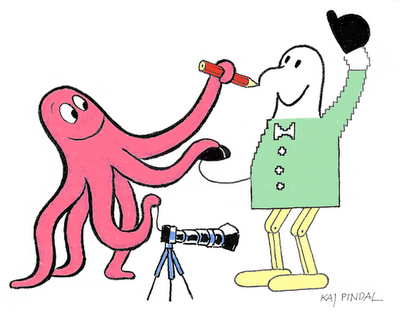 Guys With Pencils has had many interesting guests, so take a look at their roster of shows. 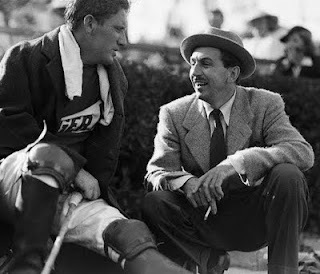 I’ve long been aware that Walt Disney knew Spencer Tracy. There’s a 1938 photo of them together with Tracy in polo togs and I knew that Disney also played polo. Having read the excellent Spencer Tracy: ABiography by James Curtis, I learned that the relationship was longer and deeper than I knew. While the Tracys and Disneys knew each other from polo, the Tracys also entertained the Disneys at their home. Disney later funded a $12,000 short film, Listening Eyes, made by the clinic to explain its procedures and supplied the director, Larry Lansburgh, from his studio. When the Disneys sailed on the Queen Elizabeth to Europe in July of 1952, Spencer Tracy was also on board and they socialized during the trip. In 1957, Disney hired John Tracy, who by then had attended Choinard, to work at the studio. He eventually was in charge of the cel library. John left Disney when his sight deteriorated and he was no longer able to do the job. In 1961, Disney was on the ticket sales committee for a fundraiser for the John Tracy Clinic and in 1967 after Walt’s and Spencer’s respective deaths, the Disney Foundation donated $100,000 to the John Tracy Clinic. Katarina Antonic, a new graduate of Sheridan's animation program, has started a Sheridan animation channel on Vimeo and it already has 58 films on it. Some are fourth year films, done by individuals, some are group films from third year and some are 24 hour films. For the past several years, during reading week in the fall and winter semester, students have organized their own 24 film projects. It was started by Ashltyn Anstee, now at JibJab, and was continued this year by Charlie Richards. While many Sheridan films play festivals or have been uploaded, many more are rarely seen. I hope that this channel becomes a hub for student work. On May 8 at 7 p.m. at the TIFF Bell Lightbox, Sheridan College's animation program will present a retrospective of student films. Thirty six of the over 500 films created in the last 5 years have been selected to show the range of work done by Sheridan students. Information can be found here and tickets can be purchased in advance here. Deadline Hollywood reports that Brad Bird's next project is another live action film and he's still developing his own live action film, 1906. I think that we've seen the last of Bird as an animation director. Michael Sporn is once again trying crowdfunding to help finance his animated feature based on the life and work of Edgar Allen Poe, this time using Indigogo. Readers of this blog will recall that Michael previously tried this using Kickstarter, but the campaign failed to reach its goal. That may cause some of you to think that the project isn't worth supporting. That's wrong on several counts. First, I've written about my admiration for Michael here, here and here. He is exactly what North American animation needs: an independent who is interested in content that Hollywood ignores. He has a long history of tackling serious subjects and working in a wide variety of design styles. He values good animation, regularly employing artists of the calibre of Tissa David, Rudolpho Dimaggio, John Dilworth, Dante Barbetta, etc. He has collected many awards for his work over the years. Second, he perseveres. There are people who, faced with the possibility of failure, don't bother to try. There are others who try and once they fail, give up. While nobody likes to fail, it is often a very valuable experience. Those who fail and try again, using the lessons of the failure to inform their next attempt, are those who eventually succeed. Michael has scaled down his financial goal and is promoting the campaign daily on his blog. I will once again be pledging money towards getting this project made.